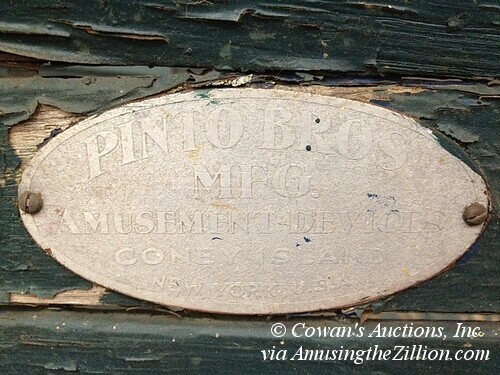 The owner found the piece at an antique mall in Lexington, Kentucky, where its name plate and Coney Island provenance went unnoticed: Pinto Bros Mfg. Amusement Devices, Coney Island, NY, USA. Among the kiddie rides that they manufactured and advertised for sale were a carousel, ferris wheel, rocket, roller coaster, miniature trains, sail boats, fire engine and pony carts. In June 1948, the Billboard reported that Pinto Bros three new kiddie pony and cart rides built in their shop at 2940 West 8th Street were featured at Feltman’s park, in McCullough’s lot adjoining the Dangler on West 15th and Surf, and in Asbury Park. The brothers Albert and Silvio, along with their cousin Henry and father Silvio Sr., also operated a variety of other rides in Coney Island, including a Mangels Whip, a Scrambler, and the Tornado roller coaster and Spook House. When the widening of the street for the New York Aquarium construction swallowed up their shop in 1954, they continued to manufacture ride parts for customers and operate rides. In 1959, the Pinto family bought the Cyclone roller coaster, which they operated before selling it to the City a decade later. 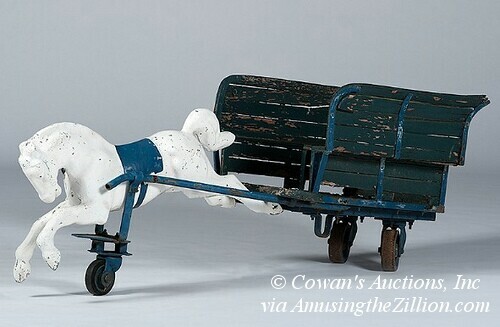 According to a post with reminiscences of the Pinto Brothers on the Coney Island History Project’s blog “Ask Mr. Coney Island,” a pony and cart was restored at the Merry-Go-Round Museum in Sandusky, Ohio. The price realized for the Pinto Bros. Pony Cart was $470.00. I’ve wanted to write something about the Pinto Bros for quite awhile. Lucky find for someone!